My son and I headed outside early this morning to soak up as much vitamin D as possible. We have been lacking because of the ridiculous amount of rain we get each week here in Germany. Although, I guess we did have the rain to thank for the abundance of mud we had to play with. 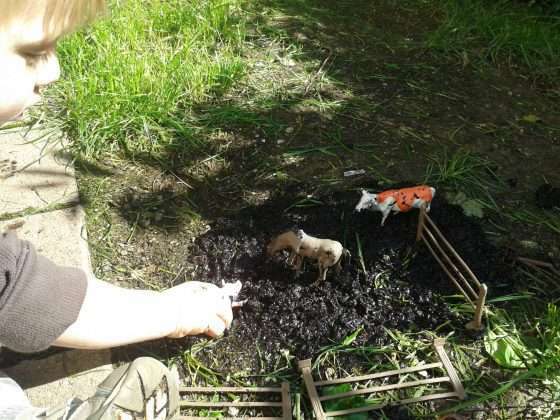 So, with a pile of mud and an inexpensive pack of plastic farm animals (with corral fencing included), we created a little farm to play in. Actually being outdoors for this activity was ideal. We had natural light, fresh air, mud, grass and plenty of room. Nathan seemed to really enjoy squishing the mud through his fingers and walking the pig through it all. I was actually surprised that by the end of our playtime, that he wasn’t completely covered in mud. 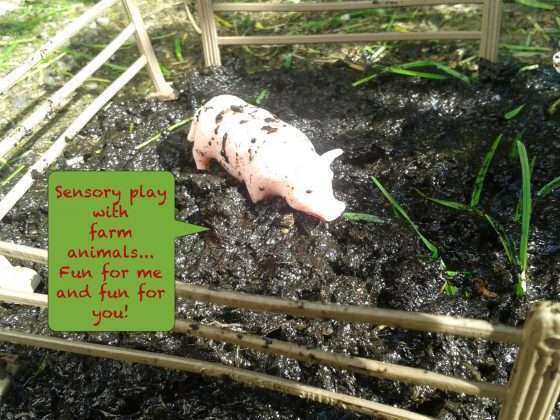 We both had such a great time, I think I could adapt it (for our next rainy day) to be contained in a sensory table. If you’re like me and don’t have a sensory table purchased from a teaching supply store, no problem. A long, shallow Rubbermaid container works perfectly. Set it on a sturdy surface (e.g. a kiddy table or another container that is filled with winter jackets) and be sure that it is at a comfortable height for little ones.